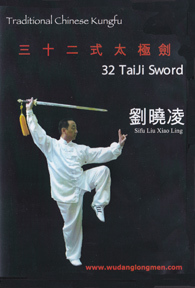 Pound for pound, Liu Xiao Ling is one of the most popular teachers on our site, especially considering the small number of DVDs he has produced from his wide range of styles and systems. The reasons are simple. His movements are accurate and simultaneously explicit. He contends himself with the “internal” arts such as Qigong, Xing Yi and LiuHeBaFa. And he loses none of that clarity when adding a new form, the Wu Tai Chi Sword, to his repertoire. A good, simple production with multiple camera positions and different filming angles. Almost no verbal instruction in either Chinese or English, the form itself—and its easily accessible presentation—being the teacher. Posted June 7, 2017 by Plum Staff. Comments and trackbacks are open. Follow the comments feed. Martial language is nearly universal. No doubt about his popularity on this website. Master Liu’s is phenomenal, I watched him on YouTube, his skill level is so high, It’s about the polish, the absolute beauty of his performance, rather than how deadly or powerful he looks! Between him and Adam Hsu, I don’t know which I would run to study with, given the choice.